This spring has been an eye opener. 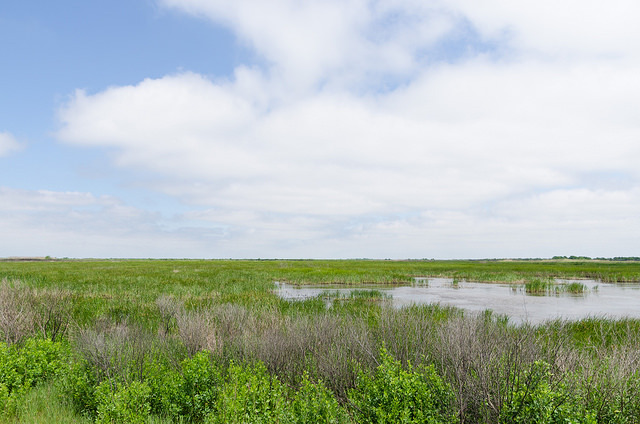 I’ve watched the harried activities of nesting birds at Smith Oaks Bird Sanctuary, seen roseate spoonbills up close for the first time in my life, and I’ve enjoyed the varied bird life among the reed lakes of Anahuac National Wildlife Refuge. Once you start noticing the squawks, chirps and flutterings up in the tree tops, it’s hard to look away. It’s exciting to be caught up in a new interest! I’ve done my best to identify the birds I’ve seen, though it isn’t always easy. Sometimes, two different species look so much alike, it’s impossible for an amateur to accurately identify them. Then there’s the issue of remembering all their names. The more common birds—the ones I see all the time—are easy to remember, but what about the ones I see a couple of times a year? Well, their names are not. FortunateIy, I don’t have to know their names to enjoy them. Having seen first hand the frenetic activity associated with migration and procreation, I decide to spend my time wisely; I need to be outside, where all the migratory action happens. 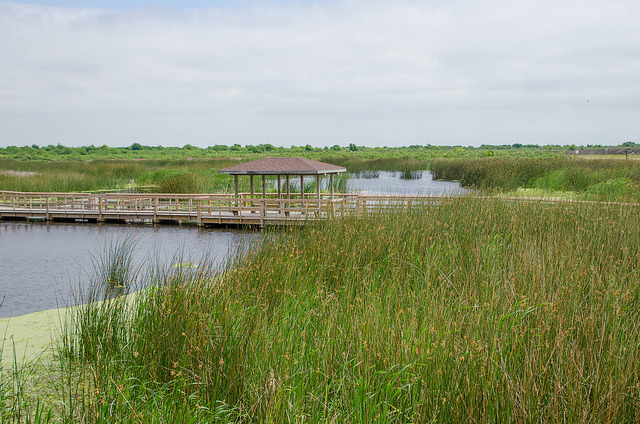 My experience at Anahuac showed me that there’s more on offer here in Texas than just the state parks. Eighteen wildlife refuges are scattered across the state but most lie along the coastline, so that’s where I need to go. 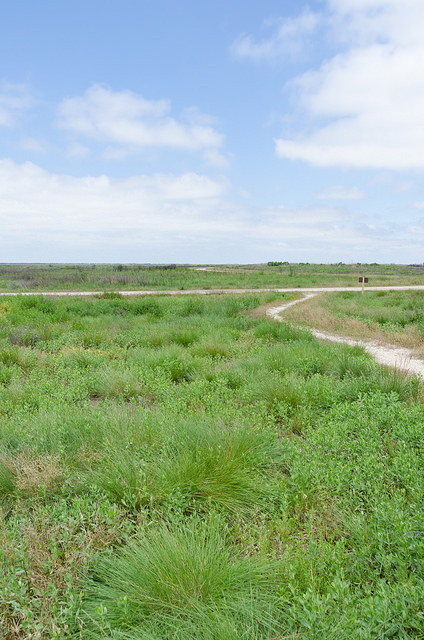 Brazoria National Wildlife Refuge lies an hour’s drive south of downtown Houston. It’s a long journey from our home in the Woodlands, so I decide that in order to make the most of our day, we should add a few more locations to our itinerary. Our first stop will be Brazoria, after which we’ll continue to Quintana, where we’ll have a picnic lunch. Next, we’ll follow the coastal road across Follets Island until we arrive on Galveston Island, where we’ll make a couple of stops before heading home. Yes, you’re right—it did turn into a very long day. As the tale is rather long, I’ll break the story of our day into two posts. I like to have a clear idea of what we’ll see when we visit a new place, so I normally look for a map and information about visitor centers, wildlife, etc. Unfortunately, it’s a bit of a challenge finding this type of information on the wildlife refuge websites, but it’s essential you spend the time. I find that neither the refuges themselves nor their websites are as user friendly as those of the Texas State Parks. 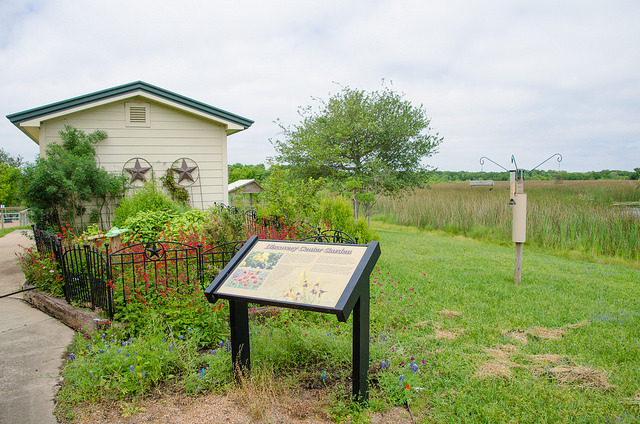 Our first stop after entering Brazoria National Wildlife Refuge is the Discovery Center. There are some large ponds behind the visitor building as well as a short trail. It’s nice to get out of the car for a bit and we look forward to crossing the boardwalk to see what we can find. 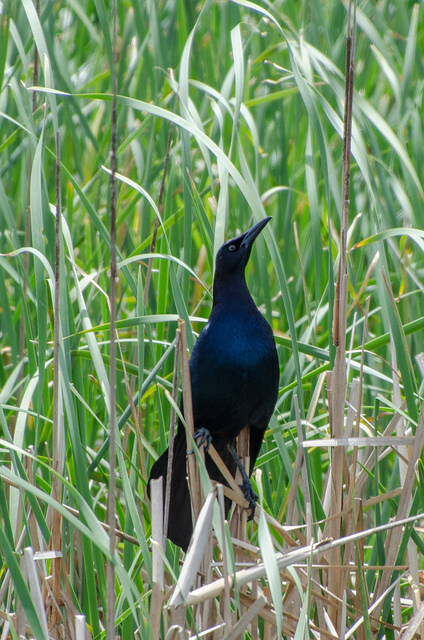 We watch the birds in the pond, discover eye catching wildflowers along the trail, and, a few hundred feet in, we are surrounded by a large and enthusiastic population of mosquitoes. We do our best to ignore them, but they’re persistent and we end up scurrying back to the parking lot. Before leaving home, I took a screenshot of the Big Slough Auto Tour Guide and saved it to my phone, which makes everything very easy now that we’re driving. The auto tour concept seems common to many of the refuges and it has both benefits and drawbacks. I would have liked to be able to get out and experience the landscape up close by meandering down a hiking trail, especially after a long drive, but that’s not something that seems commonly offered by the refuges. What many of the refuges do seem to offer is an auto tour, which provides a very convenient way of seeing a large area. 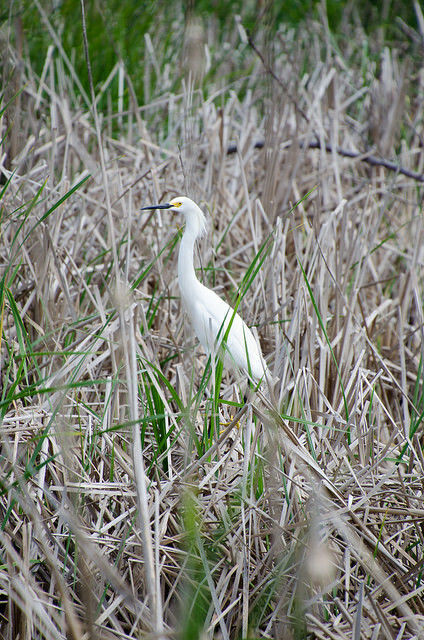 On the day we visit, we discover a variety of birds at Olney Pond, one of the first stops on the route. There aren’t any other cars on the road, so I step out and get a few pictures and we continue in this stop/start fashion for half a mile until I see another car closing on us. At this point, I become concerned about getting in the way of other visitors, so I don’t get out of the car again until we’re past the pond, which I later realize is a huge mistake since all the bird activity is happening at Olney Pond. 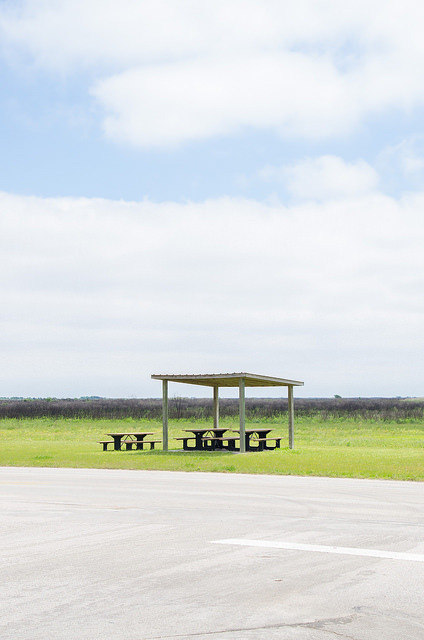 The refuge does not provide parking areas along the 7.5 mile tour route but if there are cars behind you, all you need do is find a grassy area where you can pull over so they can pass. As we continue our tour, we surmise the refuge must provide the ideal habitat for red-winged blackbirds; they seem to be everywhere! This isn’t a bird I see often, so I end up taking many more pictures of them than necessary. 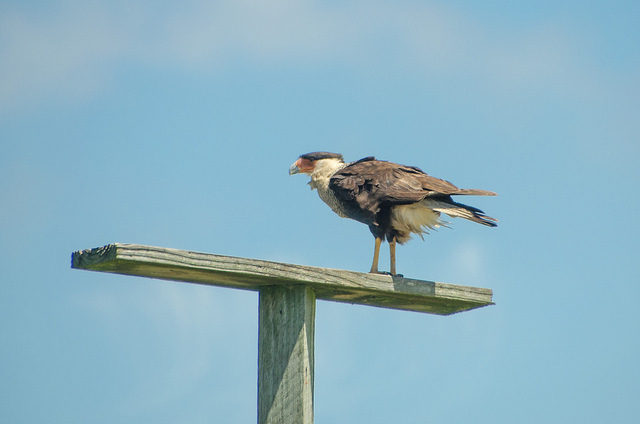 We also see a caracara, which is exciting since it’s only been a few weeks since I saw my first at Anahuac National Wildlife Refuge. Apart from the many bird pictures, I also capture a good number of landscape images. These coastal vistas are impressive not in spite of their monotony but because of it. 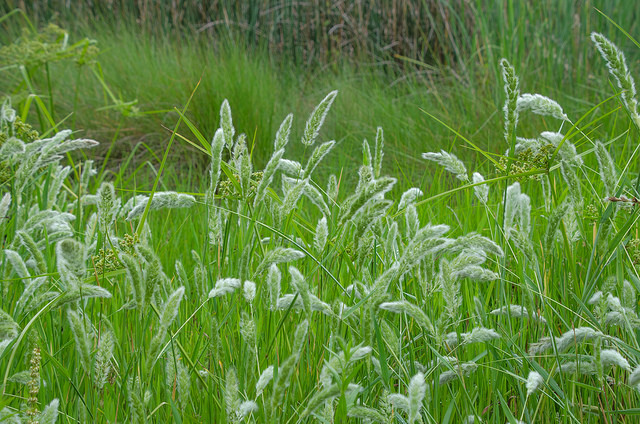 Tall grasses stretch for miles into the distance, open water revealing the marshy landscape here and there. The enormous cloud dotted blue above provides a beautiful contrast but I can imagine it must be equally impressive to stand here during the approach of a storm. As we exit the refuge, I feel a sense of regret at lost opportunities. Out there, in the marsh, the cycle of life continues. I imagine how much there is to see and learn—if only I could get close. In the end, it has to be enough to know that in my loss of opportunity lies the protected future of the animals and plants who reside here.